Dr John Tagg is the founding scientist of the company. He acts as a scientific consultant to the Company and has an important role in the direction of strategic research of the Company. John is an accomplished communicator. Dr Tagg is a semi retired Professor of Microbiology at the University of Otago. He is a world recognised expert in the fields of streptococcal and bacteriocin research. He has over 30 years experience in microbiology and has a special interest in BLIS-producing organisms. Professor Tagg’s personal passion to find a better answer to controlling Streptococcal infection was inspired by his own experience when as a teenager he contracted a Streptococcus pyogenes infection that lead to rheumatic fever and a need to be on a daily penicillin regime throughout his teenage years. He is regularly invited to chair sessions and to present the findings of his group at national and international conferences in the fields of streptococcal and bacteriocin research. His high and sustained research productivity over 25 years is reflected in more than 115 publications and reviews in peer-reviewed journals. Professor Tagg has been a regular member of the Health Research Council Biomedical Assessing Committee and has frequently reviewed contributions to microbiological journals, especially Applied and Environmental Microbiology of which, he is a member of the Editorial Board. Professor Tagg has been a Committee member, Treasurer, Vice-President and President of the New Zealand Microbiological Society. BLIS is an acronym for Bacteriocin-Like-Inhibitory- Substances. Certain strains of microorganisms, such as salivarius found in the mouth and throat, naturally produce BLIS substances. These BLIS substances act as natural antibacterial agents to help control against the growth of undesirable bacteria which are implicated in certain diseases. There are two BLIS strains in Carotec’s Oral Probiotic; BLIS K12 and BLIS M18. BLIS K12 (S. salivarius) is an advanced oral probiotic developed for the mouth and throat. S. salivarius is a friendly or beneficial bacteria and one of the most numerous bacteria found in the oral cavity. Normal probiotic bacteria compete with other bacteria for space and nutrients. BLIS probiotics have an additional antimicrobial ‘punch’. BLIS K12 is unique compared to other S. salivarius strains in that BLIS K12 produces two antimicrobial agents called Salivaricin A and Salivaricin B. These are two naturally occurring and potent anti-microbial proteins. Infections cause the majority of sore throats and are contagious. Infections are caused either by certain varieties of bacteria or viruses such as the flu or the common cold. Infections in the nose and sinuses also can cause sore throats, because mucus from the nose drains down into the throat and carries the infection with it, especially at night. Are there studies showing BLIS K12 to have promise? There are now many published scientific studies that show that those people who have potent BLIS producing streptococci, like BLIS K12, have significantly less acquisition of group A streptococci and also sore throats. Children with BLIS K12 or K12-like S. salivarius are less likely to acquire bacterial infections from pathogens such as Streptococcus pyogenes. This is shown in the study (presented below) conducted by Professor John Tagg at the University of Otago’s Medical School. Streptococcus pyogenes (Group A streptococci) are the most significant contributors to bacterial sore throats which may in some cases lead to the more serious rheumatic fever. In the laboratory, all of the S. pyogenes that have been tested are killed by the antimicrobial molecules produced by BLIS K12. Does BLIS K12 help immunity? Users of the oral probiotic, BLIS K12 reported that taking the bacterial lozenges at the onset of flu-like symptoms appeared to help prevent further development of the symptoms. 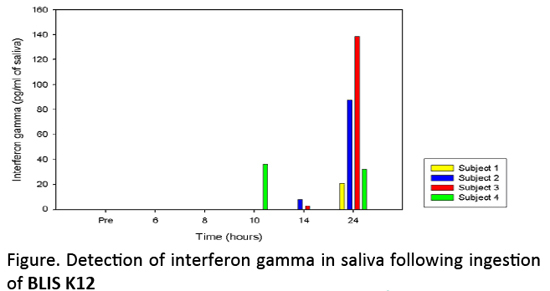 Interferon gamma is known to contribute to nonspecific immunity against many intracellular bacteria and viruses. In previous studies it has been reported that IF N gamma can be detected in saliva samples during viral infections at concentrations up to 25 pg/ml. Research at BLIS Technologies Ltd has shown that human and murine leukocyte preparations will produce IFN-gamma when exposed to BLIS K12 cells. Does BLIS K12 help bad breath (halitosis)? A major use of BLIS K12 is for the treatment of halitosis. Halitosis or bad breath is a wide-ranging affliction mainly caused by the breakdown of proteins on the tongue by certain bacterial types and subsequent release of undesirable metabolic by-products, such as various volatile compounds. Other causes of the problem range from periodontal disease, nasopharyngeal and sinus problems, side effects of medication, systematic disease, eating certain foods and smoking. There is a published study in a peer reviewed journal of BLIS K12 upon halitosis. That is only HALF of the story with Carotec’s Oral Probiotic. The other ingredient, BLIS M18, is vitally important for periodontal health; that is teeth and gums. BLIS M18 is a patented oral probiotic providing advanced protection for teeth and gums. BLIS M18 was developed from a specific strain of s. salivarius, a common and beneficial oral bacterium, which has been clinically proven to promote the health of the oral cavity by continuously supporting and promoting the health of teeth and gums. The mouth is a constant battleground where, on a daily basis, billions of invasive bacteria attempt to displace the native and generally beneficial bacteria of the mouth, teeth and gums. Common problems people often experience in their oral cavity, such as dental cavities, bad breath or gum disease, result from an s. salivarius is among the most important and beneficial bacteria of the mouth and oral cavity. It is also one of the most dominant bacteria found in the oral cavity and substantial research links S. salivarius with good oral health. However, some s. salivarius are more beneficial than others and BLIS M18 is one of those highly beneficial bacteria. Unfortunately, a very small number of people produce the kind of s. salivarius with BLIS M18 activity. BLIS M18 is a special kind of s. salivarius Not all strains of s. salivarius act equally to inhibit oral and dental pathogens. BLIS M18 is a naturally occurring strain that is especially potent at inhibiting s. mutans, the oral bacteria widely accepted to be a main cause of dental caries and tooth decay. Why is M18 so unique? M18 goes above and beyond regular probiotic activity because it produces anti-microbial proteins called BLIS (Bacteriocin-Like Inhibitory Substances). Most other probiotics work by competing with bacteria for space and nutrients in the mouth and in this way help prevent over-growth of bad bacteria. BLIS M18 is different. Not only does it compete for space and nutrients but it also produces three potent antibacterial BLIS molecules; salivaricin A, salivaricin 9, and salivaricin X. Most people practice regular oral hygiene routines, such as brushing their teeth, flossing and using mouthwash to reduce the “bad” bacteria in their mouths and freshen breath. However, these practices, while important, only provide short-term results and in some cases can actually disrupt the natural balance of beneficial microorganisms in the oral cavity. BLIS M 18 are naturally occurring and potent antimicrobial proteins actively which target and selectively kill pathogens. M18 has unique enzyme producing abilities that allow it to break up dental plaque and neutralize acid that can be harmful to teeth and gums. This is a unique attribute of BLIS M18 and not found in any other oral probiotics. In vitro studies have shown BLIS M18 is a potent inhibitor of s mutans. Does BLIS M18 protect against acid erosion? BLIS M18 Protects teeth from acid erosion: Organisms responsible for dental plaque like s. mutans produce lactic acid from dietary carbohydrate. Lactic acid degrades tooth enamel and dentine (a major component of teeth) which can lead to cavities and eventually tooth loss. Research has shown that M18 produces an enzyme called urease which neutralizes acid in the oral cavity. Does BLIS M18 break up dental plaque? BLIS M18 Breaks up dental plaque: While streptococcus mutans are able to produce acid they also produce extracellular polysaccharides which contributes to the plaque biofilm or the sticky structure which allows the problematic bacteria to be in close association with dental tissue. Limited numbers of S. salivarius strains, including M18, produce an enzyme called dextranase, which can help break up the plaque biofilm caused by S. mutans. The School of Dentistry at the University of Otago in New Zealand performed a clinical study with M18 in children ages 5 to 10 years who had experienced dental caries (with at least 3 restorations). Additionally, the children selected had at least 104 cfu/ml of salivary s. mutans and no natural BLIS-producing s. salivarius. Clinical examination recorded soft tissue health, gingival health and dental plaque scores at monthly intervals during the active treatment and at time points post treatment. Treatment was either two M18 or placebo lozenges daily for 3 months with 50 subjects in each group. The data showed that when strain M18 colonizes in the oral cavity it has the ability to significantly decrease s. mutans levels in saliva. 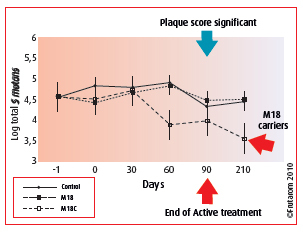 At three months, plaque scores were significantly reduced in subjects in the M18 group, not only those that had managed to maintain long-term colonization of M18. How can I purchase Carotec’s Oral Probiotic? Carotec an independent organization and is not affiliated with American Free Press or any subsidiaries.